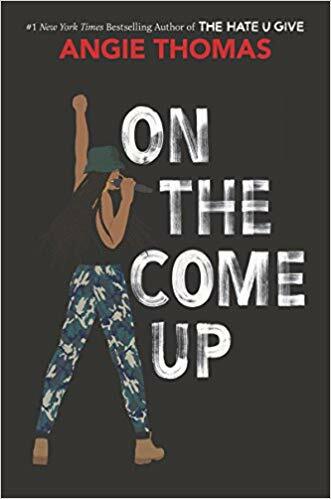 A young rapper dreams of hitting it big, in hopes of helping her struggling family, in Angie Thomas’ ON THE COME UP. Thomas takes us back to Garden Heights (THE HATE U GIVE) where we meet 16-year-old Brianna Jackson. Her mother is a recovering drug addict, while her father—a hip hop legend in the making—was gunned down when Bri was a young girl. But despite her father’s fate, Bri dreams big and wants to make it on her own merit. She dreams of escaping a reality of daily injustices, of having food in the fridge and shoes that aren’t coming apart. Of doing her part to help her mother and brother—the latter who’s put his own graduate school dreams on hold to help their family. She finally gets the chance to tout her lyrical prowess in a battle that gets people talking. Taking it a step further, she records a song that channels deep frustrations. While her intent is to deconstruct stereotypes, everyone takes it as proof of her criminality. At school, she’s stigmatized as a hoodlum, treated unjustly by those who ought to protect, sent to the Principal’s office for any small screw up. Meanwhile, her manager pushes her to play a role—a role that makes the white executives promise big. Bri struggles to find herself, her voice, in situations that are intensely complicated, but once she does, it’s a joy to experience. The narrative is deeply personal and real. Thomas takes us along as we bear witness to the many (and commonplace) social injustices teenagers like Bri face, to the devastating circumstances they have to work harder (than most) to overcome. Complicated parent relationships, success at a cost, love and heartbreak, are all issues cleverly tackled as part of Bri’s story. And despite the realness and rawness, there is so much joy and love in these pages too. Love for family, love for rap, love for dreaming big and finding your voice. With edge, emotion and a hip-hop beat, this is an unforgettably compelling coming-of-age story that every person ought to read.